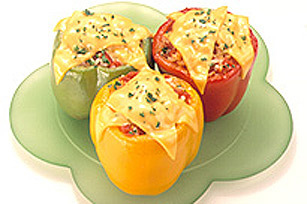 No need to head out to your favourite Mexican restaurant to enjoy these cheesy stuffed peppers. They're easy to make at home, for a tasty side dish any night of the week. Prepare 2 cups rice according to package directions and combine with 1 can (28 oz) drained, diced tomatoes, 1 minced garlic clove, 1 chopped onion and 1 tsp dried rosemary. Cut off tops of 4 medium peppers, green, red or yellow and remove seeds. Spoon rice mixture into hollowed out peppers and bake for 30 min at 375°F. Remove and place one KRAFT SINGLES Process Cheese Food Slice on top of each pepper and return to oven for an additional 3 min to melt cheese.